The resort town of Saugatuck, Michigan, is a popular place for Chicagoland residents to buy second homes. Many well-maintained cabin-style houses can be found throughout the area, but the selection of contemporary homes is limited. 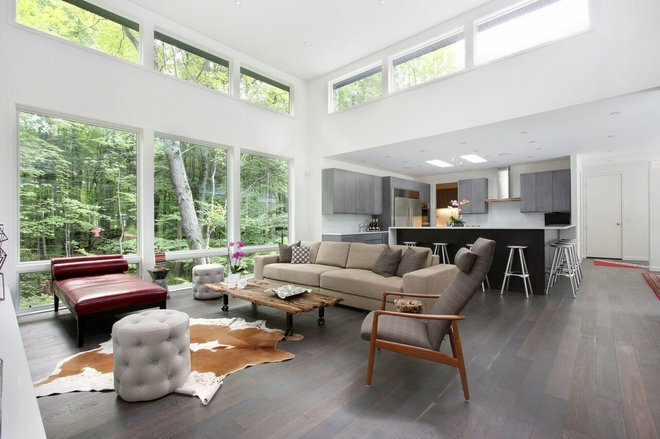 When these homeowners found a wooded lot within walking distance of the beach on Lake Michigan, they jumped on the opportunity to build their dream modern getaway. Who lives here: This is a year-round vacation home for a professional couple from Chicago. The home’s exterior is a combination of two different cement sidings. Vertical cement boards were painted in Benjamin Moore’s Blackjack and used to cover the garage door and surrounding wall. The other siding near the front door is fiber cement board with stainless steel channels running in between. The entire interior is painted in Benjamin Moore’s Super White, for crisp white gallery walls. The house is built into the side of a hill, so the view out the back windows provides an elevated vista of the lush trees beyond. The oak floors on the first level were deliberately treated with a chemical that darkens the wood in an uneven manner, and then were finished with an oil-based stain. Three of the four living area walls have clerestory windows. A set of sliding doors leads to a screened-in patio and a pool area beyond. A collection of vintage, contemporary and rustic furniture pieces decorates the living area. “We wanted to avoid a sterile feeling, so a lot of the pieces provide warmth and texture to the space,” Shingledecker says. A midcentury Danish armchair was covered in a men’s suit fabric. The fireplace surround is made out of Calacatta gold marble. The chandelier over the dining table is a reproduction of a contemporary design. An Oriental area rug previously owned by the homeowners provides an eclectic note. Knowing that guests tend to migrate to the kitchen, the homeowners wanted a large island with two sides for counter stools. 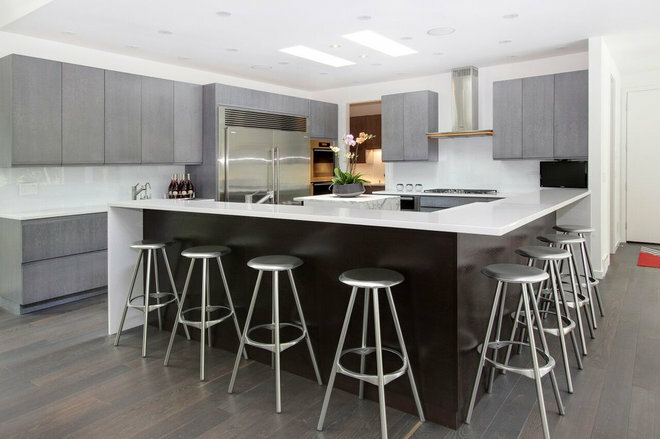 The kitchen has cabinets made of rift-cut oak in a cerused gray stain, white quartz countertops and a back-painted glass backsplash. The media room includes a cleft white quartz fireplace surround and a series of built-in cabinets made from white MDF. The cabinets utilize touch-latch hardware, allowing them to close flush with the wall. The back corner of the media room has two walls of floor-to-ceiling windows that provide a majestic view to the backyard. The rusted metal stool is a family heirloom; it has a vintage tractor seat that one of the homeowners’ grandfathers once rode upon. 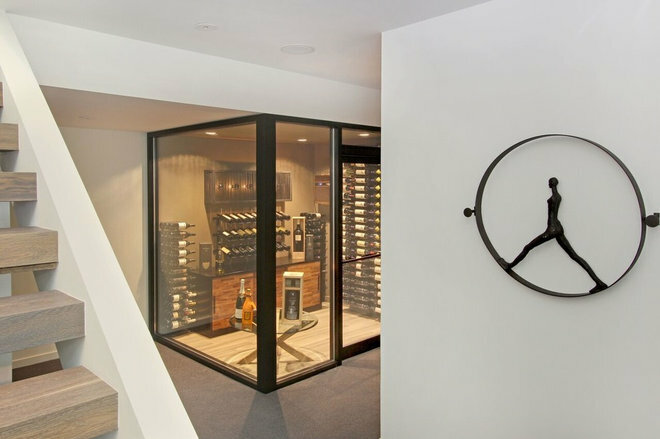 A set of open riser stairs leads to the downstairs level, which includes the home’s three guest bedrooms and a walk-in wine cellar for the homeowners’ ever-growing bottle collection. In one of the guest bedrooms, two paintings of human bodies with animal heads were found by Shingledecker at an antiques store in the Marais neighborhood of Paris. “People think they’re just paintings, but they’re actually cabinets,” the designer says. The master bedroom includes a wall of frosted French doors that lead to his-and-her walk-in closets. 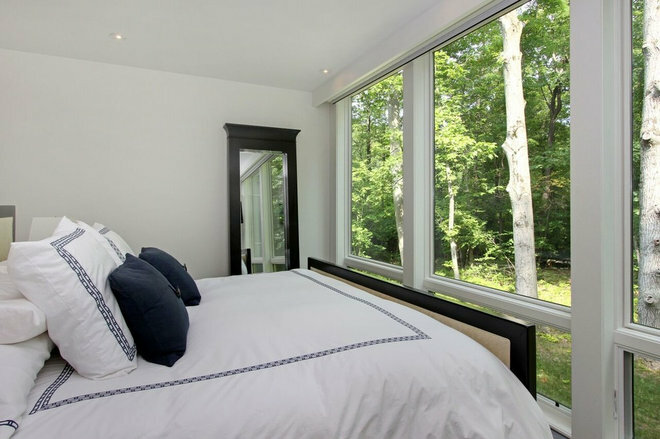 The bed “floats” in the center of the room so the homeowners can lie in bed and look straight out at the forest through the windows. 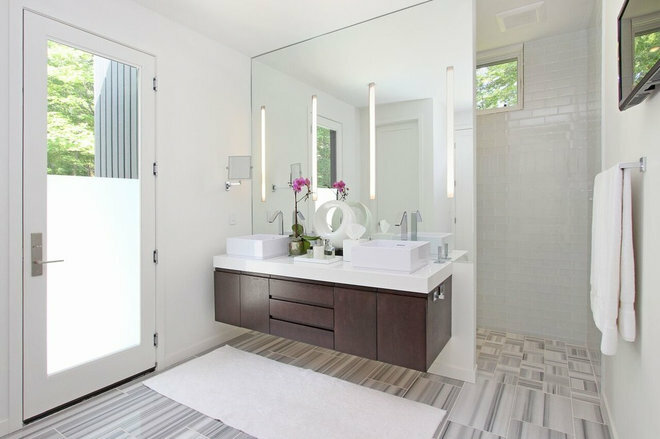 A floor-to-ceiling mirrored wall separates the double vanity from the shower in the master bathroom. Four channels were cut into the mirror to hold LED lights. Marble tile covers the floor. The Zen-like landscaping for the pool area was designed by Craig Bergmann. Holes were drilled into the iridescent glass mosaic pool tile to hold two umbrella poles. The white outdoor furniture is from Janus et Cie, and the hot-pink pillows were custom-designed by Shingledecker using Sunbrella fabric.